Plastics Technology 1 will introduce injection molding operations, basic injections mold design, and advanced injection molding. 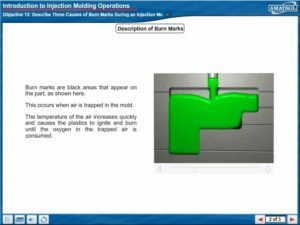 Topics explored are injection molding process, material and machine safety in molding, molding operations, problems and solutions. 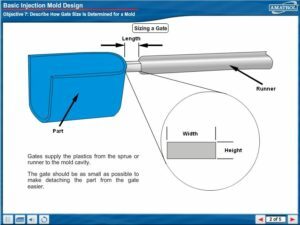 Basic injection mold designs are described and covers injection mold sprues, runner systems, injection mold gates, part design; shrinkage and warpage, and injection mold vents. 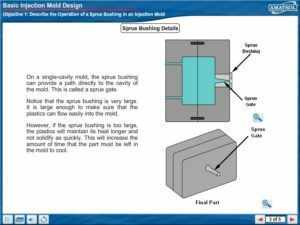 Advancing in injection molding will explore inserts in injection molds, threads and multiple-part molds, integral hinges, and system purging.